The current version of Nebulas Mainnet is 2.0, which is called Nebulas Nova. Nebulas Nova aims to discover the value of blockchain data, and it also means the future of collaboration. Check our Youtube Introduction for more details. You can download the Nebulas source code to compile the private chain locally. To learn about Nebulas, please read the Nebulas Non-Technical White Paper. To learn about the technology, please read the Nebulas Technical White Paper and the Nebulas github code. At present, Nebulas can only run on Mac and Linux at this stage. The Windows version will be coming later. Nebulas is implemented in Golang and C++. Homebrew is recommended for installing golang on Mac. Note: GOPATH is a local golang working directory which could be decided by youself. After GOPATH is configured, your go projects need to be placed in GOPATH directory. Clone source code with the following commands. NBRE is short for Nebulas Blockchain Runtime Environment, which is the platform that runs the core protocols and algorithms. cd build & cmake -DRelease=1 .. The preparation steps listed above may take some time to complete. Go dependencies in Go-Nebulas are managed by Dep. make dep downloads lots of dependencies. It might take a long time to download for the first time. Some dependencies may fail to download. If you can not download, you can directly download the zipped dependency files generated by dep vendor.tar.gz and extract it to the nebulas root directory. Before launching a new Nebulas chain, we have to define the configuration of genesis block. # Neb genesis text file. Scheme is defined in core/pb/genesis.proto. An example genesis.conf is located in conf/default/genesis.conf. Before getting a neb node started, we have to define the configuration of this node. # Neb configuration text file. Scheme is defined in neblet/pb/config.proto:Config. # For the first node in a new Nebulas chain, `seed` is not need. 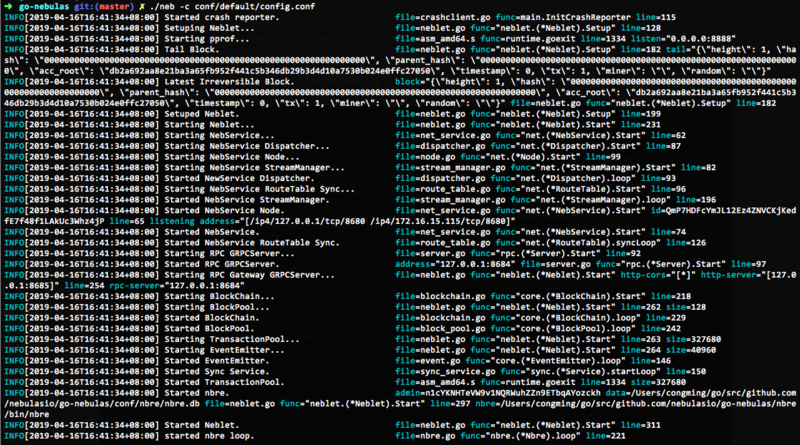 # Otherwise, every node need some seed nodes to introduce it into the Nebulas chain. # P2p network service host. support mutiple ip and ports. # The private key is used to generate a node ID. If you don't use the private key, the node will generate a new node ID. The Nebulas chain you are running at this point is private and is different with official Testnet and Mainnet. Start your first Nebulas node with the following commands. 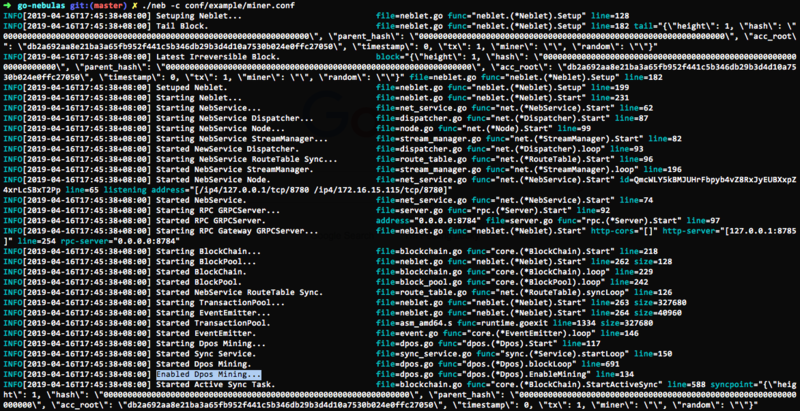 By default, the node using conf/default/config.conf won‘t mine new blocks. Start your first Nebulas mining node with another commands. Note: You can start many nodes locally. Please make sure the ports in your node configurations won‘t conflict with each other.